When attempting to identify a wood sample, it’s important to keep in mind the limitations and obstacles that are present in our task. 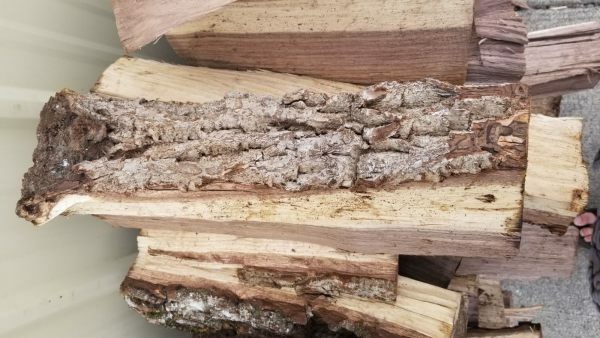 Before starting, please have a look at The Truth Behind Wood Identification to approach the task in a proper mindset; I consider the linked article to be required reading for all those visiting my site with the intent of identifying wood. 1. Confirm it is actually solid wood. Before proceeding too much farther into the remaining steps, it’s first necessary to confirm that the material in question is actually a solid piece of wood, and not a man-made composite or piece of plastic made to imitate wood. A solid piece of Cocobolo: note how the grain naturally wraps around the sides and endgrain of the wood. Can you see the end-grain? Manufactured wood such as MDF, OSB, and particleboard all have a distinct look that is—in nearly all cases—easily distinguishable from the endgrain of real wood. 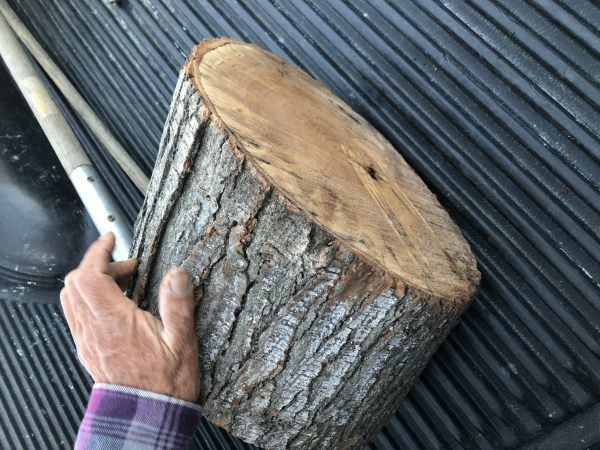 Look for growth rings—formed by the yearly growth of a tree—which will be a dead-giveaway that the wood sample in question is a solid, genuine chunk of wood taken from a tree. Viewing the end of this “board” reveals its true identity: particleboard. Is it veneered? 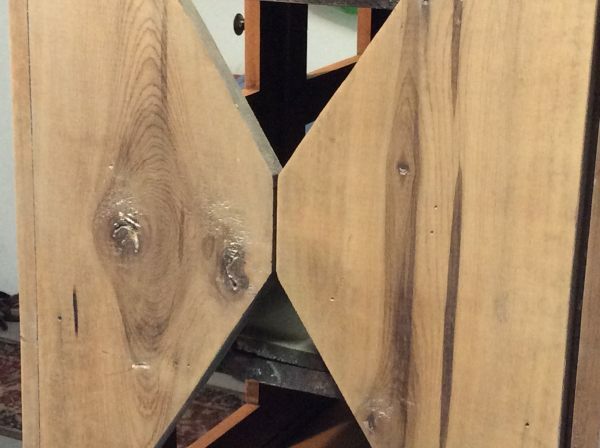 If you see a large panel that has a repeating grain pattern, it may be a veneer. In such cases, a very thin layer of real wood is peeled from a tree and attached to a substrate; sometimes the veneer can be one continuous repeating piece because it is rotary-sliced to shave off the veneer layer as the tree trunk is spun by machines. 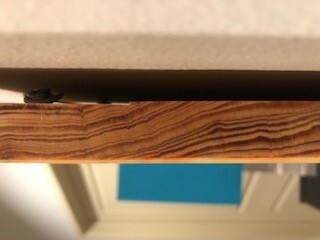 Assuming it is a real wood veneer with a distinct grain and texture—and not merely a piece of printed plastic—you may still be able to identify the outer veneer wood in question, but you should still realize that is it only a veneer and not a solid piece of wood. Large repeating patterns suggest a veneer. Is it painted or printed to look like wood? 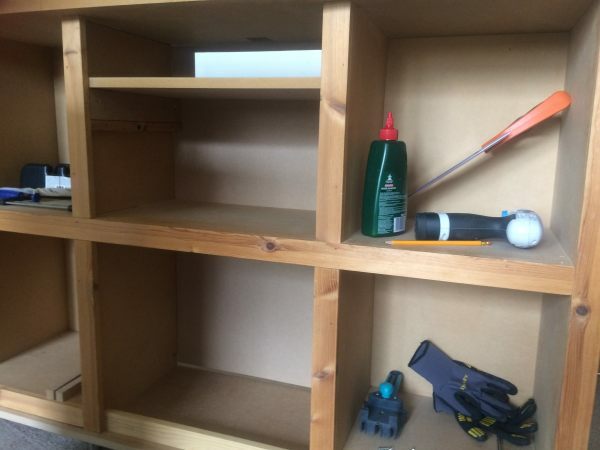 Many times, especially on medium to large-sized flat panels for furniture, a piece of particleboard or MDF is either laminated with a piece of wood-colored plastic, or simply painted to look like wood grain. Many of today’s interior hardwood flooring planks are good examples of these pseudo-wood products: they are essentially a man-made material made of sawdust, glues, resins, and durable plastics. 2. Look at the grain color. Is the color of the wood natural, or is it stained? If there is even a chance that the color isn’t natural, the odds are increased that the entire effort of identifying the wood will be in vain. 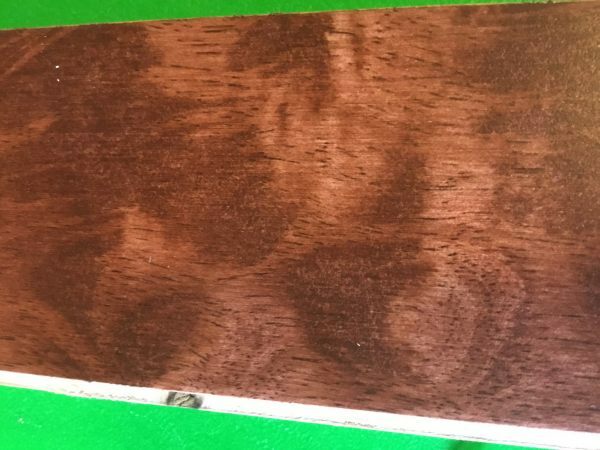 The reddish brown stain used on this piece of Jatoba (Hymenaea courbaril) has been planed away on top, exposing the paler color of the raw wood underneath. Is it weathered or have a patina? Many woods, when left outside in the elements, tend to turn a bland gray color. 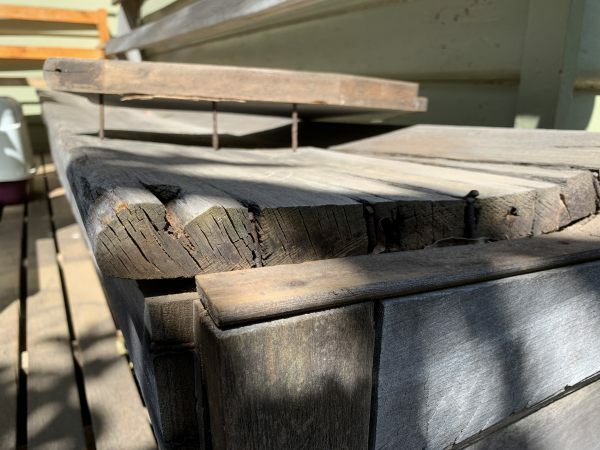 Also, even interior wood also takes on a patina as it ages: some woods get darker, or redder, and some even get lighter or lose their color; but for the most part, wood tends to darken with age. 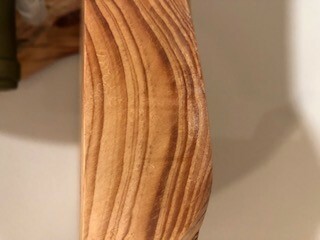 Fresh sanding near the end of this Osage Orange (Maclura pomifera) board has exposed the characteristic yellow coloration of the wood, which has a strong tendency to shift down to a golden brown over time. Is it possible to sand or plane the board to see the natural raw color of the wood? The most predictable baseline to use when identifying wood is in a freshly sanded state. 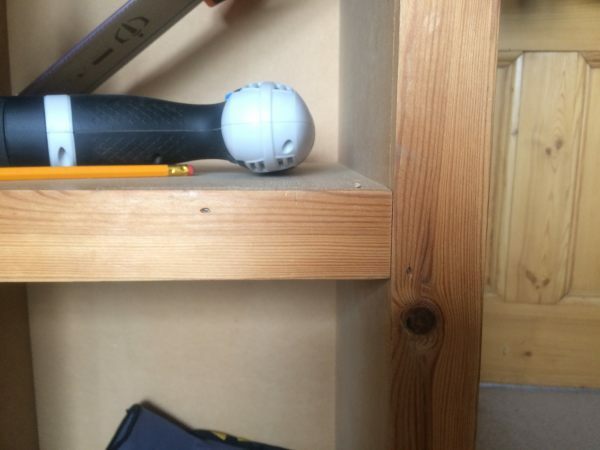 This eliminates the chances of a stain or natural aging skewing the color diagnosis of the wood. 3. Look at the grain pattern. Does the wood have an open, porous texture? 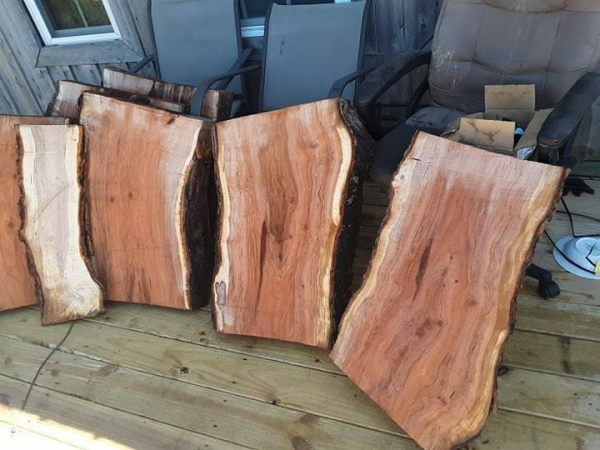 Most softwoods will be almost perfectly smooth with no grain indentations, while many common hardwoods have an open pore structure, such as Oak or Mahogany; though there are some hardwoods that are also smooth to the touch, such as Maple. Can you tell if the wood is quartersawn or plainsawn? 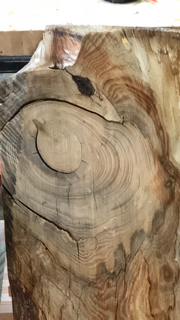 By observing the grain patterns, many times you can tell how the board was cut from the tree. Some wood species have dramatically different grain patterns from plainsawn to quartersawn surfaces. 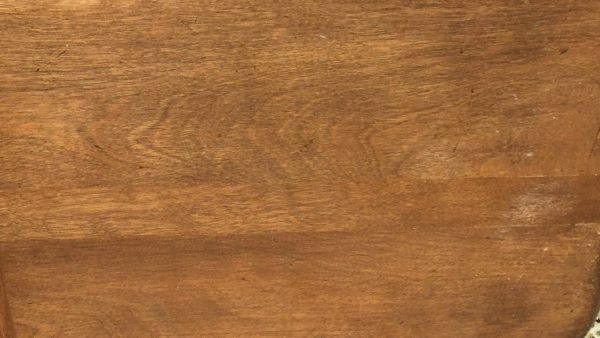 For instance, on their quartersawn surfaces, Lacewood has large lace patterns, Oak has flecks, and Maple has the characteristic “butcher block” appearance. Is there any figure or unusual characteristics, such as sapwood, curly or wild grain, burl/knots, etc.? Some species of wood have figure that is much more common than in other species: for example, curly figure is fairly common in Soft Maple, and the curls are usually well-pronounced and close together. Yet when Birch or Cherry has a curly grain, it is more often much less pronounced, and the curls are spaced farther apart. 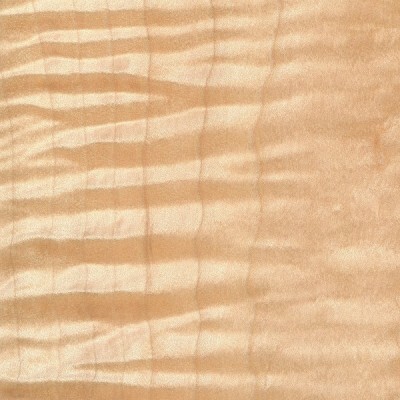 The strong, tight curl seen in this wood sample is very characteristic of Maple (Acer spp.). 4. Consider the weight and hardness of the wood. 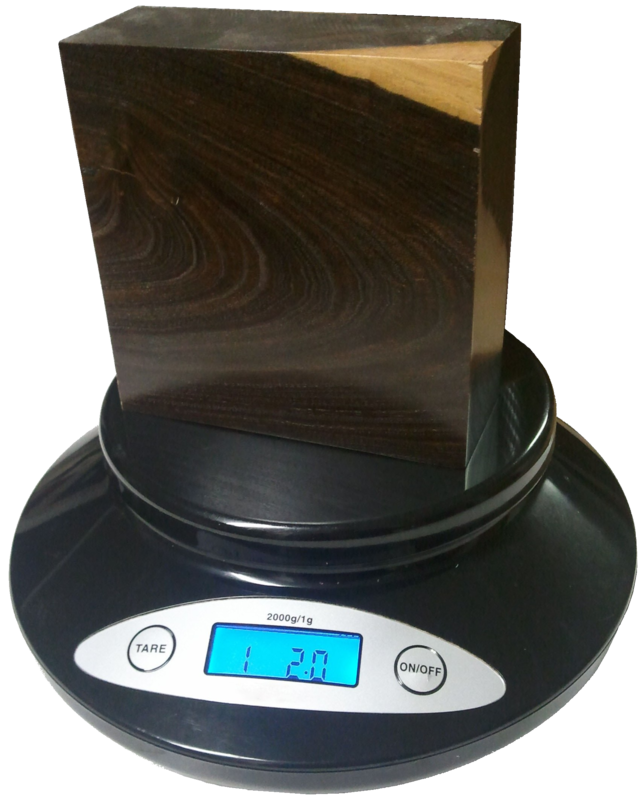 A piece of Lignum Vitae is weighed on a small digital scale. Is the wood dry? Wood from freshly felled trees, or wood that has been stored in an extremely humid environment will have very high moisture contents. 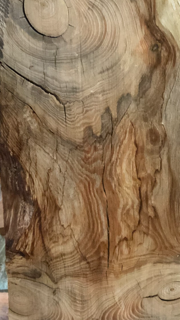 In some freshly sawn pieces, moisture could account for over half of the wood’s total weight! 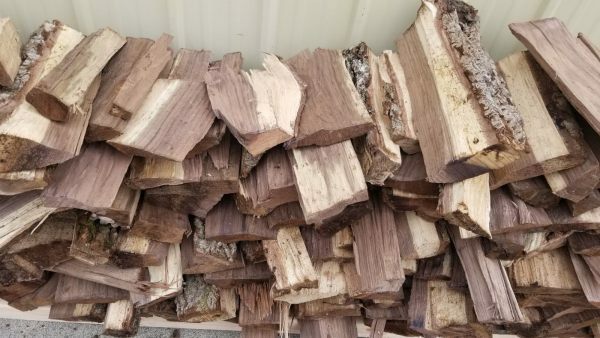 Likewise, wood that has been stored in extremely dry conditions of less than 25% relative humidity will most likely feel lighter than average. How does the wood’s weight compare to other species? Taking into account the size of the board, how does its weight compare to other benchmark woods? Is it heavier than Oak? Is it lighter than Pine? Look at the weight numbers for a few wood species that are close to yours, and get a ballpark estimate of its weight. How hard is the wood? Obviously softwoods will tend to be softer than hardwoods, but try to get a sense of how it compares to other known woods. Density and hardness are closely related, so if the wood is heavy, it will most likely be hard too. If the wood is a part of a finished item that you can’t adequately weigh, you might be able to test the hardness by gouging it in an inconspicuous area. 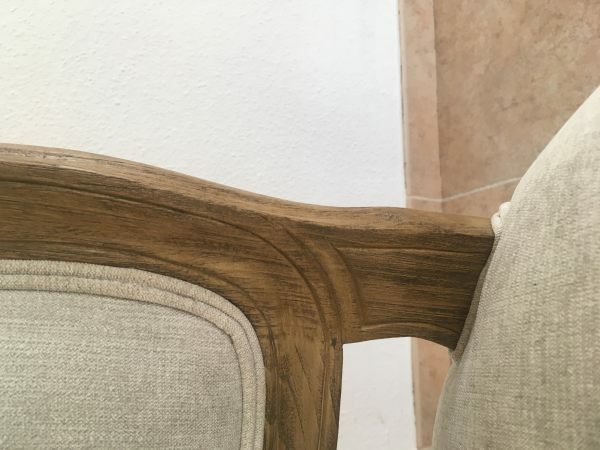 Also, if it is used in a piece of furniture, such as a tabletop, a general idea of its hardness can be assessed by the number and depth of the gouges/dings in the piece given its age and use. 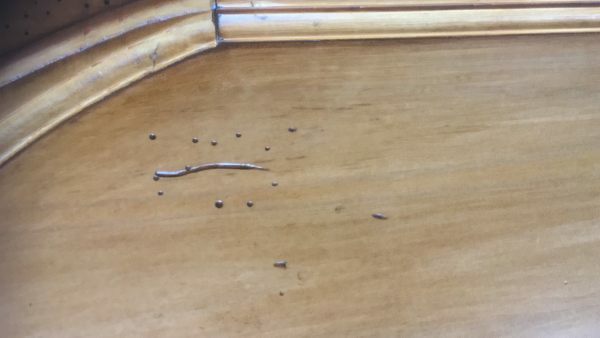 A tabletop made of pine will have much deeper dents than a tabletop made of Oak. 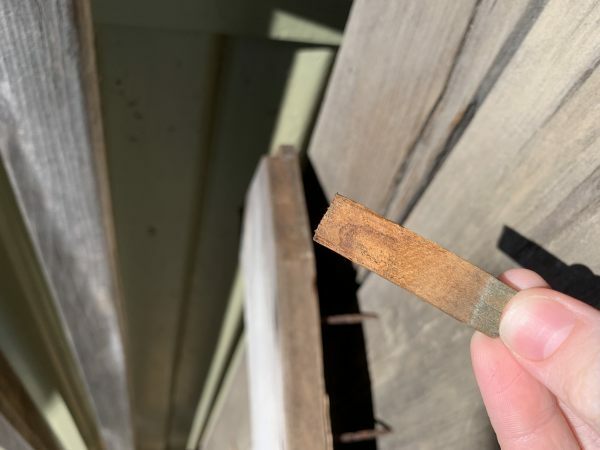 Additionally, you can always try the “fingernail test” as a rough hardness indicator: find a crisp edge of the wood, and with your fingernail try to push in as hard as you can and see if you’re able to make a dent in the wood. Where did it come from? Knowing as much as you can about the source of the wood—even the smallest details—can be helpful. If the wood came from a wood pile or a lumber mill where all the pieces were from trees processed locally, then the potential species are immediately limited. If the wood came from a builder of antique furniture, or a boat-builder, or a trim carpenter: each of these occupations will tend to use certain species of woods much more often than others, making a logical guess much simpler. How old is it? As with the wood’s source, its age will also help in identification purposes. Not only will it help to determine if the wood should have developed a natural patina, but it will also suggest certain species which were more prevalent at different times in history. For instance, many acoustic guitars made before the 1990s have featured Brazilian Rosewood backs, yet due to CITES restrictions placed upon that species, East Indian Rosewood has become much more common on newer guitars. How large is the piece of wood? Some species of trees are typically very small—some are even considered shrubs—while others get quite large. For instance, if you see a large panel or section of wood that’s entirely black, chances are it’s either painted, dyed, or stained: Gaboon Ebony and related species are typically very small and very expensive. 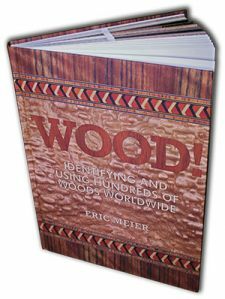 What is the wood’s intended use? 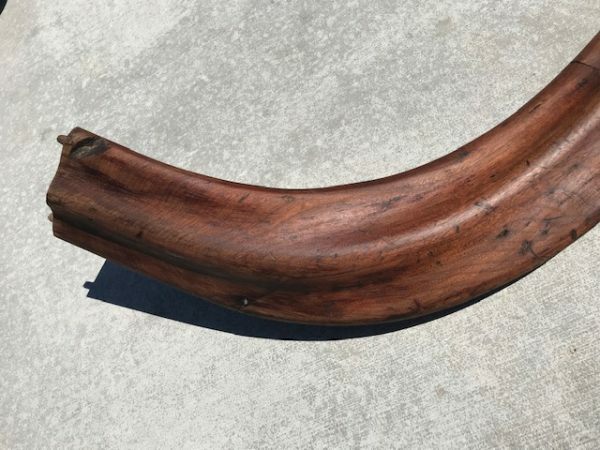 Simply knowing what the wood was intended for—when considered in conjunction with where it came from and how old it is—can give you many clues to help identify it. 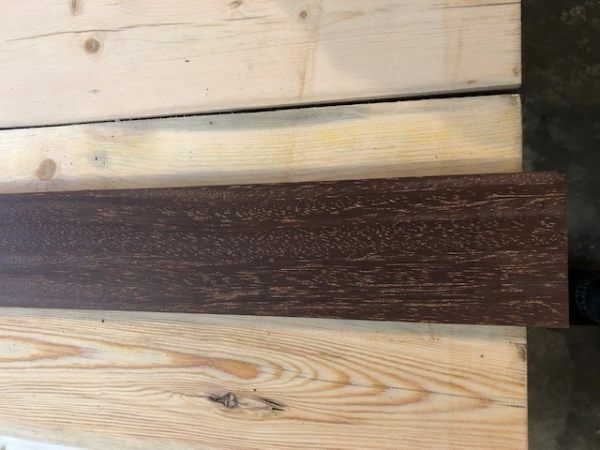 In some applications, certain wood species are used much more frequently than others, so that you can make an educated guess as to the species of the wood based upon the application where it was used. For instance: many older houses with solid hardwood floors have commonly used either Red Oak or Hard Maple; many antique furniture pieces have featured quartersawn White Oak; many violins have Spruce tops; many closet items used Aromatic Red Cedar, and so forth. While it’s not a 100% guarantee, “profiling” the wood in question will help reduce the number of possible suspects, and aid in deducing the correct species. 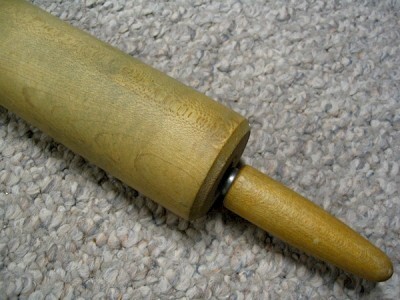 Despite its discoloration and wear, its very likely that this old rolling pin is made of Hard Maple. Sometimes, after all the normal characteristics of a sample have been considered, the identity of the wood in question is still not apparent. In these instances—particularly in situations where a sample has been narrowed down to only a few possible remaining choices—it’s sometimes helpful to bring in specialized tests and other narrower means of identification. The following techniques and recommendations don’t necessarily have a wide application in initially sorting out wood species and eliminating large swaths of wood species, but will most likely be of use only as a final step in special identification circumstances. Odor: Believe it or not, freshly machined wood can have a very identifiable scent. When your eyes and hands can’t quite get a definitive answer, sometimes your nose can. Assuming there is no stain, finish, or preservative on or in the wood, quickly sand, saw, or otherwise machine a section of the wood in question, and take a whiff of the aroma. Although new scents can be very difficult to express in words, many times the scent of an unknown wood may be similar to other known scents. For instance, Rosewoods (Dalbergia spp.) are so named for their characteristic odor that is reminiscent of roses. Although difficult to directly communicate, with enough firsthand experience scents can become a memorable and powerful means of wood identification. Fluorescence: While certain woods can appear basically identical to one another under normal lighting conditions, when exposed to certain wavelengths—such as those found in blacklights—the wood will absorb and emit light in a different (visible) wavelength. This phenomenon is known as fluorescence, and certain woods can be distinguished by the presence or absence of their fluorescent qualities. 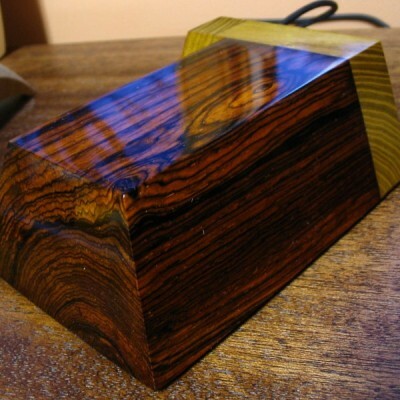 See the article Fluorescence: A Secret Weapon in Wood Identification for more information. Chemical Testing: There are only a small number of chemical tests regularly used on wood, most of which are very specialized and were developed to help distinguish easily confused species with one another. They work by detecting differences in the composition of heartwood extractives. 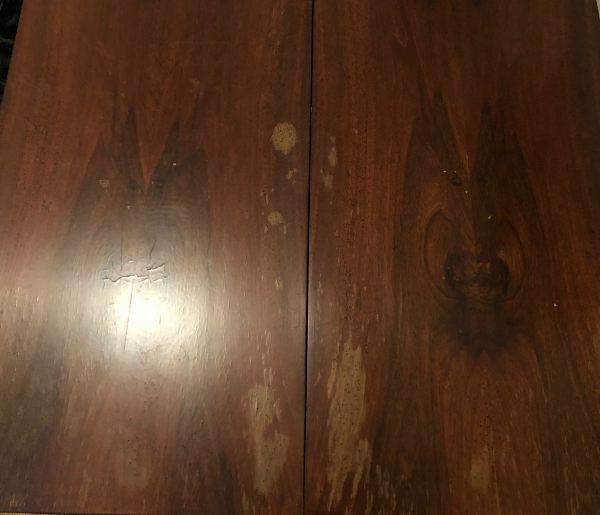 A chemical substance (called a reagent) is usually dissolved in water and applied to the wood surface: the surface is then observed for any type of chemical reaction (and accompanying color change) that may occur. Two of the most useful are the tests that are meant to separate Red and White Oak, and Red and Hard Maple. In a simple water extract color test, wood shavings are mixed with water in a vial, test tube, or other suitably small container, and the color of the water is observed after a few minutes. If the heartwood extractives are leachable by water, then a corresponding color change should quickly occur. In addition to Osage Orange (Maclura pomifera), Merbau (Intsia spp. ), and Rengas (Gluta spp. and Melanorrhoea spp.) are also noted for their readily leachable heartwood extractives. Because this property is quite uncommon, it can serve to quickly differentiate these woods from other lookalikes. 7. Look at the endgrain. 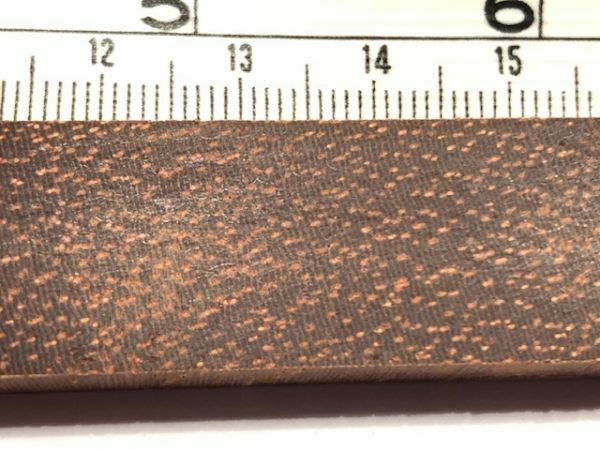 Perhaps no other technique for accurate identification of wood is as helpful and conclusive as the magnified examination of the endgrain. Frequently, it brings the identification process from a mostly intuitive, unscientific process into a predictable, repeatable, and reliable procedure. 1. A prepared surface. When working with wood in most capacities, it becomes quickly apparent that endgrain surfaces are not nearly as cooperative or as easily worked as face grain surfaces. However, in this case, it is absolutely critical that a clear and refined endgrain surface is obtained. For a quick glance of a softwood sample, a very sharp knife or razor blade can be used to take a fresh slice from the endgrain. However, in many denser species, especially in tropical hardwoods, one of the best ways to obtain a clear endgrain view is through diligent sanding. It’s usually best to begin with a relatively smooth saw cut (as from a fine-toothed miter saw blade) and proceed through the grits, starting at around 100, and working up to at least 220 or 320 grit, preferably higher for the cleanest view. These stronger magnifiers, sometimes called loupes, usually have a smaller viewing area than standard magnifying glasses. Fancier models—with built in lights, or larger viewing surfaces—are available at a premium; but the most basic models are usually only a few dollars. 3. A trained eye. The third element that constitutes a proper endgrain examination is simply knowing what to look for. In analyzing the patterns, colors, shapes, and spacing of the various anatomical features, there is a veritable storehouse of information within the endgrain—all waiting to be unlocked. Yet, if these elements have not been pointed out and learned, the array of features will simply seem like an unintelligible jumble. 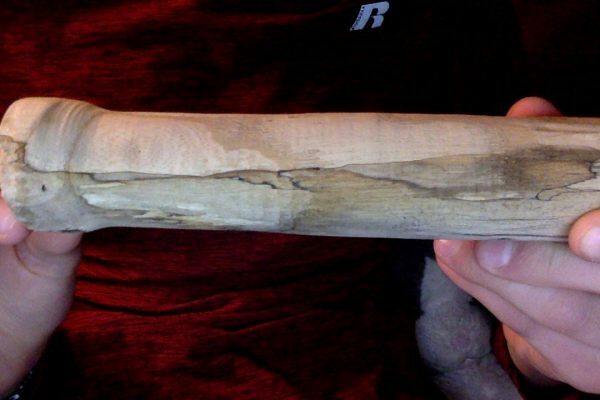 If you have a mysterious piece of wood that you’d like identified, I would recommend contacting the Center for Wood Anatomy Research, (part of the USDA’s Forest Products Laboratory), for a free, reliable, and professional identification. This is a free service available to all US citizens: they will identify up to five wood samples per year. See their Wood ID Factsheet. Check out the list of the most common hardwoods used in the United States to help eliminate the most obvious choices. For somewhat immediate gratification, you can post ID requests to the Wood Database Facebook page, and be sure to include picture(s), and any pertinent information you may have! 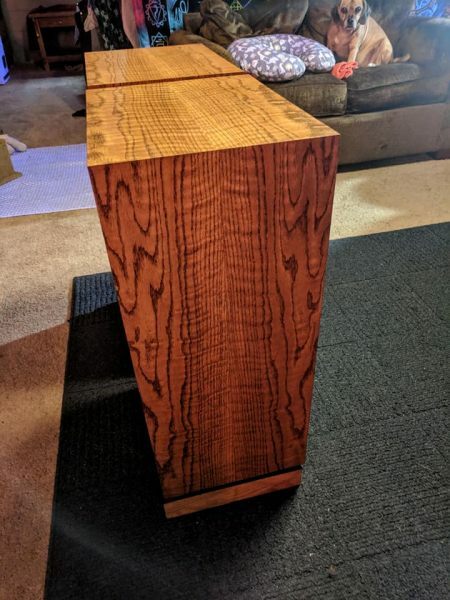 Can someone identify this wood? Possibly maple or birch? 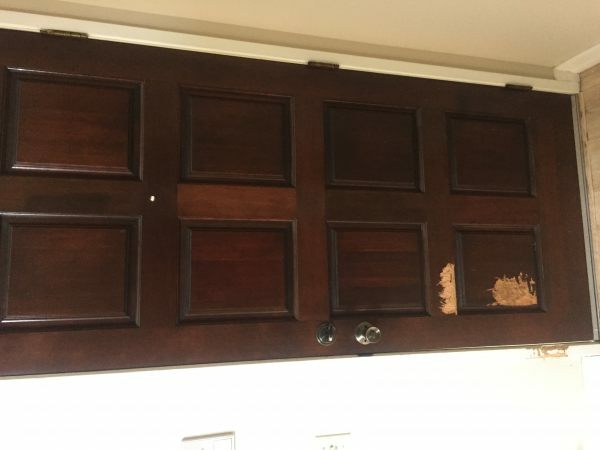 Is this wood stained? Would need to see a closeup of the endgrain to give more info. Anyone have any idea? 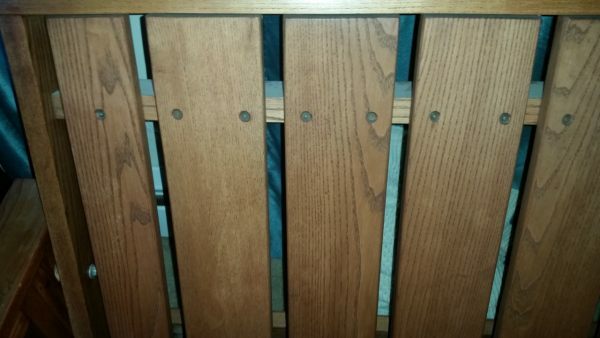 It’s a futon a carpenter made for me 22 years ago, and I cant remember what type of wood it is. 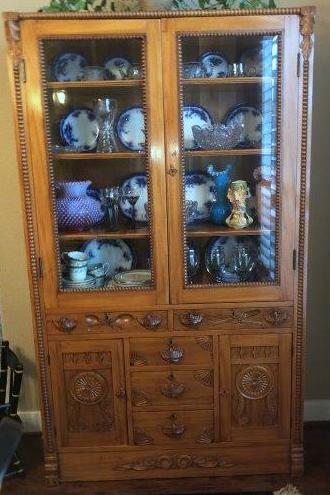 Only hints I have is it was made in the northeast, it is stained, and it’s relatively heavy. Thanks! I’d say most likely candidate is stained ash. Could also be oak, but I don’t see any hints of rays in the picture, though it could be just the picture, but no rays suggests ash over oak. It looks like a lacewood-type of wood, though can’t be sure of the species. There’s a chance it could just be quartersawn sycamore. Hi There! I found this in my community wood shop and created a few things out of if. The shop says it only harvests native Coloradan wood. But no one seems to know what it is. Not even sure if this is native to CO. Can you help? Thank you Eric. I have some close ups of the resin canals. Does this help at all? Thanks! Sorry, I can’t quite see enough detail in those pictures to confirm/deny the presence of resin canals. Basically, if there’s a lot of resin canals, it’s probably pine, if there’s less (or none), it’s something else. Hi..can someone please help me ID this wood. Dining table with buffet.. The top yellow wood looks like a type of satinwood. I would say from looking at these pieces that you should probably get a professional appraiser to look at them in person. They appear to be very high-end pieces. It is a softwood, not necessarily pine, but that’s a likely candidate. Depending on the age of the tree and the type of cut for each individual board, the appearance could vary quite a bit. 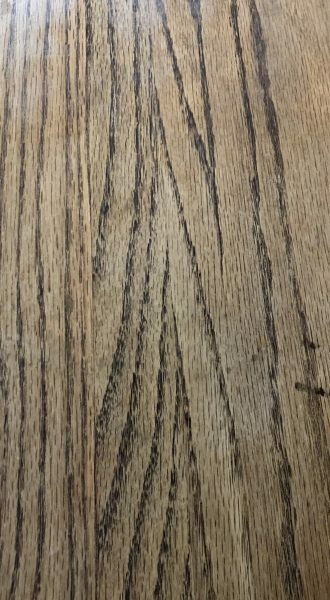 Anyone have any idea on what this type of wood is? It is super dense and heavy. The piece in question of course is the dark piece which is sitting on my picnic table. Definitely a hardwood. Came from overseas as a glut between some steel sheets. Looks like Rosewood to me. I see this color wood all the time on my guitars and it looks a lot like the fingerboards. The grain reminds me of ekki. https://www.wood-database.com/ekki/ Would need to see a closeup of the endgrain to give further ID info. After looking at the Ekki database I believe you’re correct. 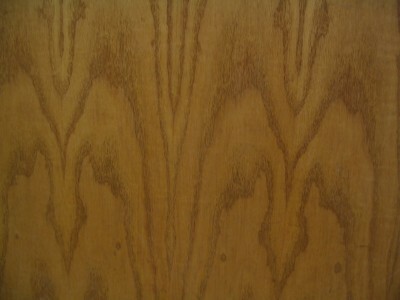 Here is a picture of the end grain. Now if this indeed Ekki, now comes the part of what should I do with it! Hello! 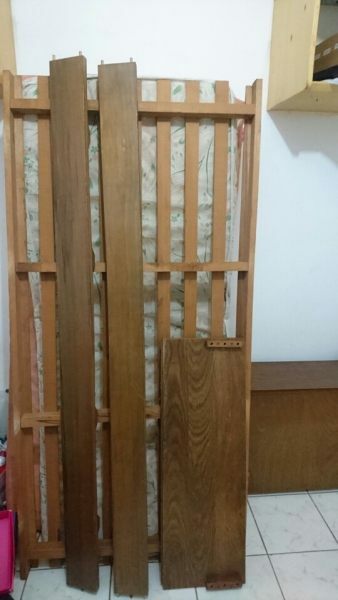 Can anyone help with identifying what type of wood this bed is? Can you get a closer picture? Can’t tell from that distance. Could anyone help me determine what type of wood this is? This is the underside of a coffee table. Thanks in advance! Reminds me of douglas fir, though it could be another type of softwood too. Read through the article, and still can’t tell what kind(if any) my table is. Can anyone help? looks like quartersawn oak. Those light light colored streaks on the face are called ray fleck, and are pretty unique to oak — at least that type of ray fleck. I second the oak, as soon as I saw it I thought Oak and then the other guy confirmed what I thought. Nice table its got to be heavy. It’s very hard to tell definitively from the pictures. But I will say that it appears the the grain lines in some areas have been rubbed off — it that’s the case, that would be a strong indicator that it’s not real wood, but very hard to tell from the pictures. Can someone kindly tell me what kind of wood this is? Thank you! I have a 60+ year old homemade table. Can anyone ok tell me what wood this is. I was told it was pecan but I am not for certain it is. 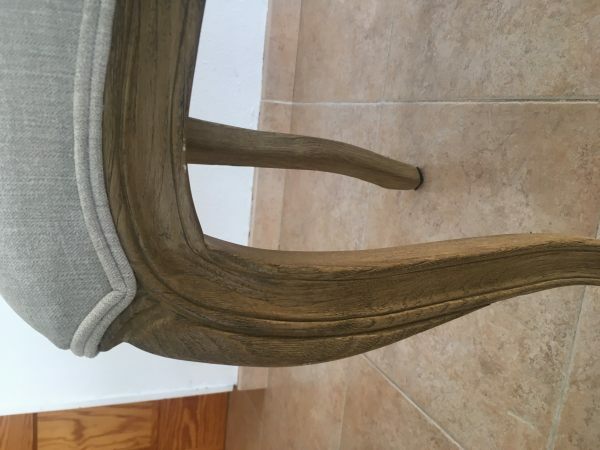 Diferenciar la jatova de las otras maderas , elondo , ipe , ? 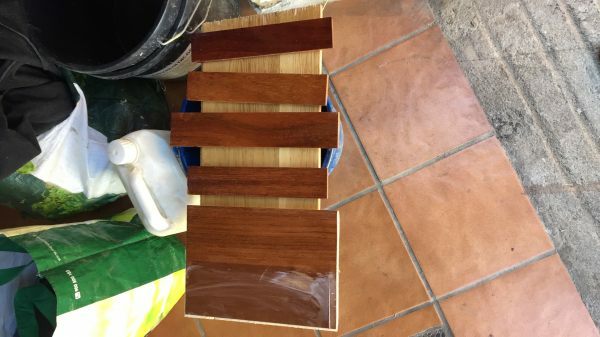 La tabla de 30×6 y la de la izquierda del todo son jatoba , las que no se qué tipo de madera es son las tablas de la medida 25×5 , alguien puede decirme si las demás son elondo o alguna parecida ? 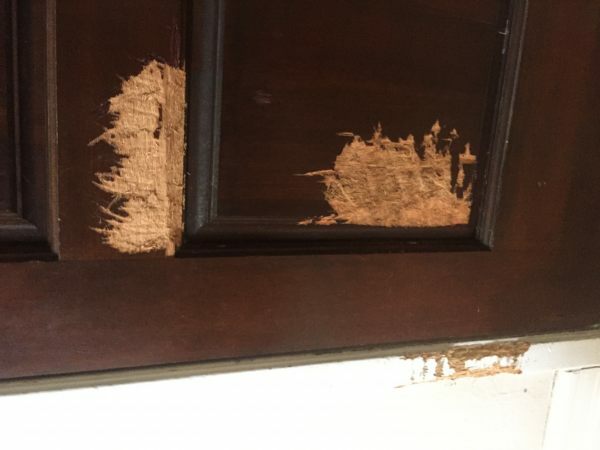 ¿¿¿Tal vez, rojo de madera??? ¡¡Lo siento por el retraso / inconveniente!! 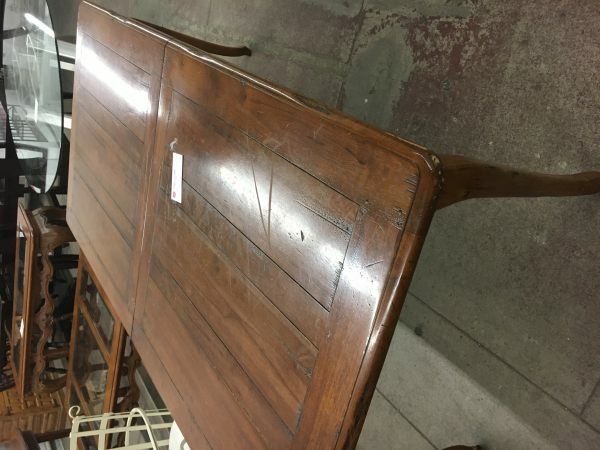 Hello – can anyone help me identify what kinda of wood this table is? 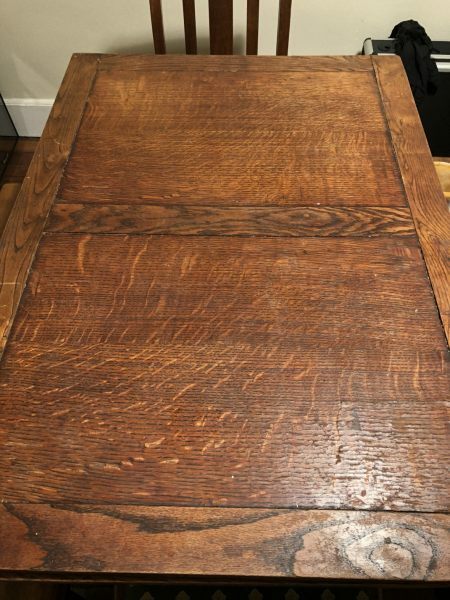 Are there any characteristics that would help me identify the age of the table? 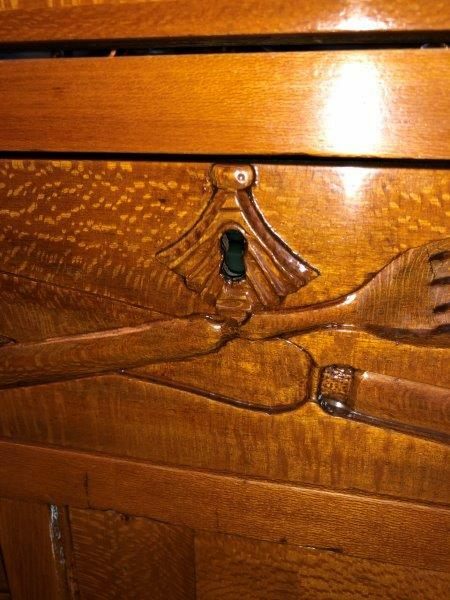 Yes… it’s a veneer (obviously) and not solid wood but can anyone identify this? 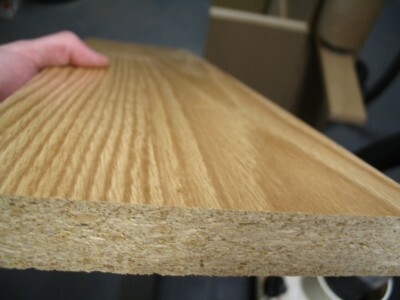 It’s close-grained and fairly dense but has the surface characteristics of white oak. Thanks. 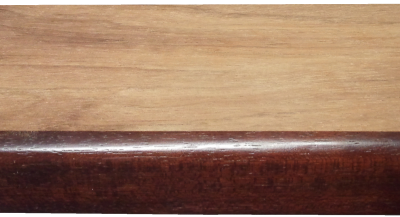 I’m refinishing a desk that looks like the same kind of wood – very fine-grained. I wondered if it might be mahogany and another reader suggested that, so I think I’m going to assume that mine is mahogany. 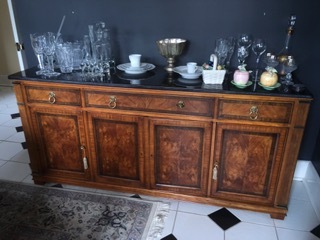 This is wood from an old cupboard found in Georgia. 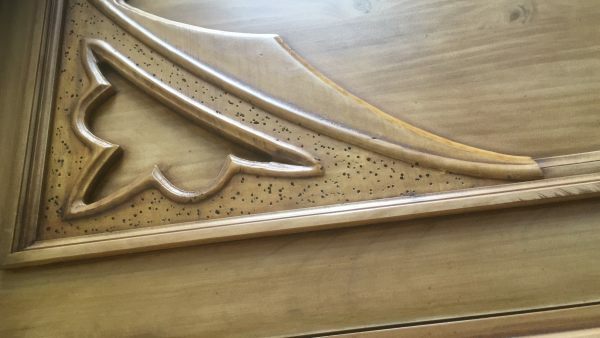 Any idea of what the wood is? anyone know what kind of wood this is ? Cherry. sap wood is light in color where the heart is red the grain has a dark shading. locally grown. sorry… blackjack or pin oak? I have some of the same stuff and it was cut in Columbia county, New York.Did you ever find out for sure what it is? 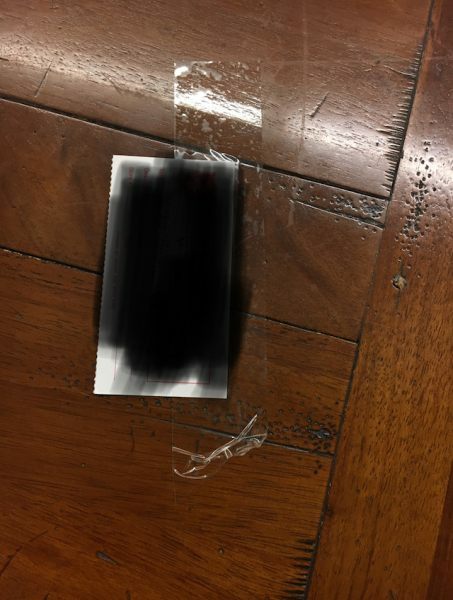 Hi I just bought this flooring at an auction. Does anyone know what it is? Thank you very much! I assumed it was spalted, but I just was not sure. Hey! 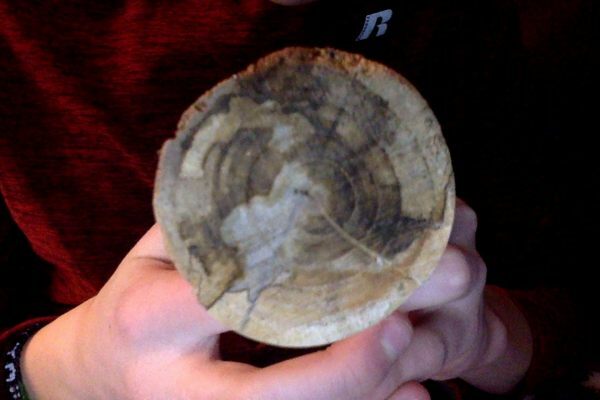 Can someone please help me identify this piece of wood. I picked it up off the ground near a birch tree; but was mildly surprised to see that it most definitely did not appear to be birch wood. So, I do not really have a clue as to what type of wood this is; any help is very much appreciated!! Thank you! Elizabeth, Possibly American chestnut? The wormholes are common. It is now considered extinct since the chestnut blight wiped it out by the 1930s. Hi, I was just wondering if you could identify this timber for me. It is from and old church pew, that has now been weathered so much that it has turned completely grey. Any help is appreciated. 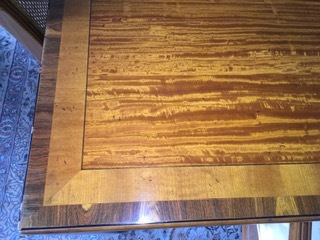 Can anyone help with identifying what type of wood this table is. Hi my name is Elizabeth ????? 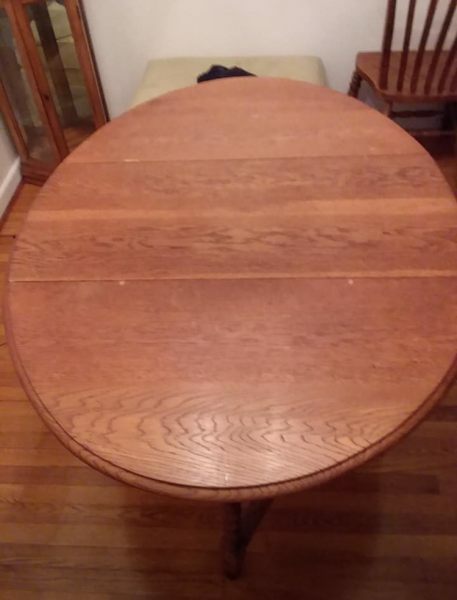 Can someone please help with identifying what type of wood this table might be. Thanking you all in advance for any help you can offer. Your expertise is highly appreciated. Elizabeth… did you ever find out what kind of wood it is? 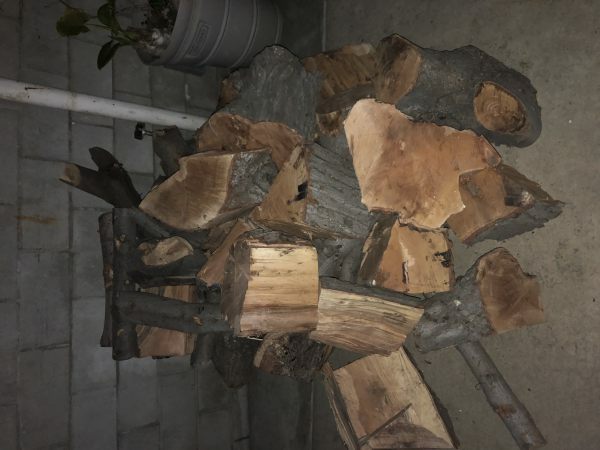 I have the same looking wood and I am trying to find out as well. I have been told that is looks like beech wood or possibly parawood. I’d love to hear what you’ve found out.